This is one of those stories that are ideal for a lazy afternoon or a weekend snooze read. Satisfying, romantic, idyllic setting, very nice people and all is right with the world. We have a young couple not married with a baby who want now to get married. 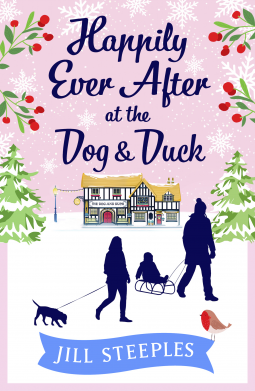 They are financially very stable - have a beautiful home, a manor in fact, and owners of a successful pub the said Dog & Duck. They are surrounded by the village with nice friends and the only worry is that something will happen to put off the much planned for wedding. A broken ankle of the bride's father, the entire barn burning down are two of the mishaps on the way on top of the bride's mother leaving her husband and turning up on their doorstep. The bridegroom's sister is a stroppy one who cannot get on with the mother so there is tension in the house but the house is sufficiently big enough for all to have their own space, thank God. A lovely read which I thoroughly enjoyed. Sent by Netgalley for an unbiased review, courtesy of Aria. Sounds like a quick, charming read. Oh does indeed sound a very cosy, sweet read, the kind I often enjoy! You read such a interesting variety of books! I like light, quick reads around the holidays.